AJIJIC LAKE CHAPALA REAL ESTATE | DEVELOPMENTS | BUILDERS/ARCHITECTS | LAKE VIEW HOMES FOR SALE!!! Are you planning to build your brand new house, condo or luxury estate? You have found the best architect - construction firm at Ajijic & Lake Chapala Jalisco Mexico. Just tell us how you like it and tell us where!!! We are an architect-builder firm based in Ajijic, Mexico, Lake Chapala that provides clients with unique design services coupled with experienced and professional project and construction management. We have more then 20 years of construction experience in mexican architecture with contracts in Yucatan, Acapulco and Lake Chapala Mexico. We are not another of the real estate agencies in Ajijic, we have the lowest real estate prices in Lake Chapala, you will save 7% of comission with us! We work comfortably on all sizes of projects, our low prices start at 55 USD / ft2. If you are planning an addition / renovation or a multi-million dollar getaway dream home at Lake Chapala Jalisco Mexico, we can help. See our new homes for sale in Chapala, Los Arrayanes, Riberas del Pilar, La Floresta, Chula Vista Norte, Vista del Lago Golf Course and Ajijic Mexico, we have them at Developer Direct Prices!!! Lake Chapala, Largest Lake in Mexico!!! Lake Chapala, Mexico nestled in a mountain valley just 50 minutes south of Guadalajara and 25 minutes from the international airport, is the largest inland body of water in Mexico. It is 90 km long and 20 km wide, situated on the border between the states of Jalisco and Michoacan and approximately a 3 ½ hour drive from the Pacific ocean. Lake Chapala Mexico has become a retirement paradise for Americans, Canadians, and Europeans; people from all over the world come to enjoy the warm days and cool nights along the beautiful lake. Ajijic - Best Retirement Area in Mexico! 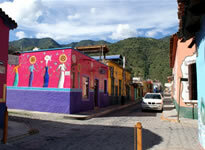 Ajijic, Mexico is a narrow strip of land between the mountains to the north and the Lake Chapala to the South. It is flanked by San Antonio Tlayacapan to the east and San Juan Cosala to the west. It is seven kilometers west of Chapala. Its average annual temperature is 19.9 degrees Centigrade "68°F". The nature of the area, weather, low cost of living, cheap real estate and the more than 25,000 retired has made of Ajijic the best place of retirement in Mexico. Chapala, Best Weather in the World!!! The weather of Chapala is probably the first attraction for tourists. 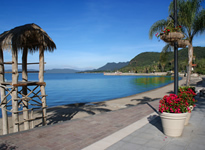 Chapala is rated by National Geografic as one of the best climates in the world. The year’round average temperature is about 28 Celsius. Chapala has been named “City of the Eternity Spring”. This village is truly a great place to retire in Mexico. Chapala is home to so much to do that you could never be bored, or unoccupied. There are lots of fiestas, clubs, and expat groups to participate in. Enjoy the best weather in the world!!! The task of making a good decision when it comes to Home Rentals & Lodging in Lake Chapala is well worth educating yourself about the do’s and don’ts. Some people come to Mexico to see if retirement in Ajijic is for them. Others visit to leave frigid winters or hot and sweaty summers behind. Because of Ajijic's weather for retirees, visitors arrive throughout the year. See a list of Lake Chapala Hotels that we can fully recommend and visit Casa Mexico's website for Ajijic Rentals.